Rheidae is a family of flightless ratite birds which first unambiguously appeared during the Miocene epoch. 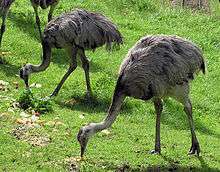 It is today represented by the sole living genus Rhea, but also contains several extinct genera. ?†Diogenornis fragilis de Alvarenga 1983 (Late Paleocene) – possibly a member of Casuariiformes instead. †Opisthodactylus Ameghino 1895 (Miocene) – rheid? ↑ Brands, Sheila (August 14, 2008). "Systema Naturae 2000 / Classification, Family Rheidae". Project: The Taxonomicon. Retrieved Feb 4, 2009. ↑ Haaramo, Mikko (2007). "PALEOGNATHIA - paleognathous modern birds". Mikko's Phylogeny Archive. Retrieved 30 December 2015. ↑ Çınar, Ümüt (November 2015). "01 → Pᴀʟᴇᴏɢɴᴀᴛʜᴀᴇ : Sᴛʀᴜᴛʜɪᴏɴɪfᴏʀᴍᴇs, Rʜᴇɪfᴏʀᴍᴇs, Cᴀsᴜᴀʀɪɪfᴏʀᴍᴇs, Aᴘᴛᴇʀʏɢɪfᴏʀᴍᴇs, Aᴇᴘʏᴏʀɴɪᴛʜɪfᴏʀᴍᴇs, Dɪɴᴏʀɴɪᴛʜɪfᴏʀᴍᴇs, Lɪᴛʜᴏʀɴɪᴛʜɪfᴏʀᴍᴇs, Tɪɴᴀᴍɪfᴏʀᴍᴇs & Rᴇfᴇʀᴇɴᴄᴇs". English Names of Birds. Retrieved 30 December 2015.